Pyunik again lost to CSKA in the UEFA Champions League, this time 0-1. FC Pyunic lost its chances for entering the third qualifying round of the UEFA Champions League competition after it suffered a 1-0 from Bulgaria's CSKA Sofia in the second leg match of the second qualifying round played on Wednesday August 6 in Sofia at Balgarska Armia stadium. After 0-2 defeat in Yerevan Pyunic must have beaten CSKA with the difference of at least two goals in an away return match to be able to continue its way to the third round. Although dominating control of the match, Pyunic failed to capitalize on several scoring opportunities. 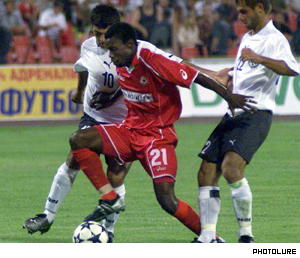 The defeat ended hopes of a long-expected Armenian-Turkish match which would have been on the schedule had Pyunic won on aggregate. Despite the crush of Pyunic in UEFA Champions League Armenian, clubs will continue their participation at the UEFA competitions. Two matches of Armenian clubs FC Shirak and FC Banants will take place on August 14 as part of the UEFA Cup tournament, the second prestigious after Champions League. On August 14 Armenian clubs will play away matches and on August 28 they will host their opponents. Shirak is playing its UEFA Cup qualification round against Danish Farum FC Nordsjaelland while Banants will meet with Israeli club Hapoel Tel-Aviv FC. President Robert Kocharyan attended closing ceremonies of the second Pan Armenian Youth gathering "Baze" at Lake Sevan on Wednesday. The Chief of State put away Presidential Pomp in favor of boogieing with the kids.